Brown, George. "George Brown: 1865 Speech in Favour of Confederation". The Canadian Encyclopedia, 05 July 2017, Historica Canada. https://www.thecanadianencyclopedia.ca/en/article/george-brown-1865-speech-in-favour-of-confederation. Accessed 21 April 2019. 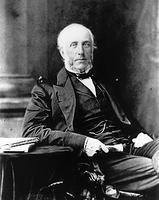 George Brown played an instrumental role in establishing Confederation. As leader of the Clear Grits (forerunner of the Liberal Party) in Canada West, he set aside political differences and allied with his Conservative rivals John A. Macdonald and George-Étienne Cartier in 1864, with whom he pitched Confederation to the Atlantic colonies at the Charlottetown and Québec Conferences. From 3 February to 13 March 1865, politicians in the Province of Canada debated the terms of Confederation, offering some of the most compelling defences and critiques of the union of British North American colonies. In the following speech, delivered before the legislature of the Province of Canada on 8 February 1865, Brown explains his reasons for supporting Confederation. This speech was transcribed by volunteers and prepared by The Confederation Debates, an initiative led by the University of Victoria to transcribe and translate the Confederation debates of each colony prior to its union with Canada from 1865 to 1949, as well treaty negotiations with Indigenous peoples. The original records were digitized by Google. The original text of this speech only contained paragraph breaks when another politician interrupted the main speaker. As a result, so​me paragraphs were 10 or 15 pages long. To make the speech more readable, we have split the contents into paragraphs. "I fearlessly assert that the scheme in your hands is a just and satisfactory remedy for the evils and injustice that have so long distracted the province." The Attorney General for Upper Canada, as well as the Attorney General for Lower Canada, in addressing the House last night, were anxious to have it understood that this scheme for uniting British America under one government, is something different from "representation by population," — is something different from "joint authority," — but is in fact the very scheme of the Government of which they were members in 1858. Now, sir, it is all very well that my honorable friends should receive credit for the large share they have contributed towards maturing the measure before the House; but I could not help reflecting while they spoke, that if this was their very scheme in 1858, they succeeded wonderfully in bottling it up from all the world except themselves (hear, hear) — and I could not help regretting that we had to wait till 1864 until this mysterious plant of 1858 was forced to fruition. (Hear, hear, and laughter.) For myself, sir, I care not who gets the credit of this scheme, — I believe it contains the best features of all the suggestions that have been made in the last ten years for the settlement of our troubles; and the whole feeling in my mind now is one of joy and thankfulness that there were found men of position and influence in Canada who, at a moment of serious crisis, had nerve and patriotism enough to cast aside political partisanship, to banish personal considerations, and unite for the accomplishment of a measure so fraught with advantage to their common country. (Cheers.) It was a bold step in the then existing state of public feeling for many members of the House to vote for the Constitutional Committee moved for by me last session — it was a very bold step for many of the members of that committee to speak and vote candidly upon it — it was a still bolder thing for many to place their names to the report that emanated from that committee, — but it was an infinitely bolder step for the gentlemen who now occupy these treasury benches, to brave the misconceptions and suspicions that would certainly attach to the act, and enter the same Government. And it is not to be denied that such a Coalition demanded no ordinary justification. But who does not feel that every one of us has to-day ample justification and reward for all we did in the document now under discussion? (Cheers) But seven short months have passed away since the Coalition Government was formed, yet already are we submitting a scheme well-weighed and matured, for the erection of a future empire, — a scheme which has been received at home and abroad with almost universal approval. HON. MR. HOLTON — (Ironically) hear! hear!! 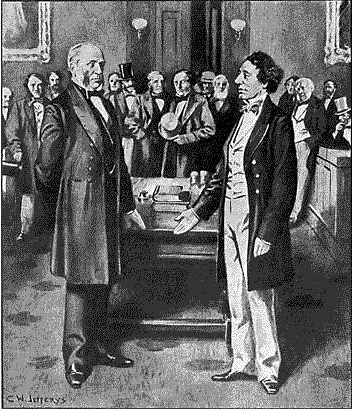 George Brown and John A. Macdonald, from The Picture Gallery of Canadian History by C. W. Jefferys. "For myself, sir, I care not who gets the credit of this scheme... the whole feeling in my mind now is one of joy and thankfulness that there were found men of position and influence in Canada who, at a moment of serious crisis, had nerve and patriotism enough to cast aside political partisanship, to banish personal considerations, and unite for the accomplishment of a measure so fraught with advantage to their common country." And will honorable gentlemen deny that the people and press of Great Britain have received it with acclamations of approval? — that the Government of England have cordially endorsed and accepted it? — aye, that even the press and the public men of the United States have spoken of it with a degree of respect they never before accorded to any colonial movement? Sir, I venture to assert that no scheme of equal magnitude, ever placed before the world, was received with higher eulogiums, with more universal approbation, than the measure we have new the honor of submitting for the acceptance of the Canadian Parliament. And no higher eulogy could, I think, be pronounced than that I heard a few weeks ago from the lips of one of the foremost of British statesmen, that the system of government we proposed seemed to him a happy compound of the best features of the British and American Constitutions. Have we not then, Mr. SPEAKER, great cause of thankfulness that we have found a better way for the solution of our troubles than that which has entailed on other countries such deplorable results? And should not every one of us endeavor to rise to the magnitude of the occasion, and earnestly seek to deal with this question to the end in the same candid and conciliatory spirit in which, so far, it has been discussed? (Loud cries of hear, hear.) The scene presented by this chamber at this moment, I venture to affirm, has few parallels in history. One hundred years have passed away since these provinces became by conquest part of the British Empire. I speak in no boastful spirit — I desire not for a moment to excite a painful thought — what was then the fortune of war of the brave French nation, might have been ours on that well-fought field. I recall those olden times merely to mark the fact that here sit to-day the descendants of the victors and the vanquished in the fight of 1759, with all the differences of language, religion, civil law, and social habit, nearly as distinctly marked as they were a century ago. (Hear, hear.) Here we sit to-day seeking amicably to find a remedy for constitutional evils and injustice complained of — by the vanquished? No, sir — but complained of by the conquerors! (Cheers by the French Canadians.) Here sit the representatives of the British population claiming justice — only justice; and here sit the representatives of the French population, discussing in the French tongue whether we shall have it. One hundred years have passed away since the conquest of Quebec, but here sit the children of the victor and the vanquished, all avowing hearty attachment to the British Crown — all earnestly deliberating how we shall best extend the blessings of British institutions — how a great people may be established on this continent in close and hearty connection with Great Britain. (Cheers.) Where, sir, in the page of history, shall we find a parallel to this? Will it not stand as an imperishable monument to the generosity of British rule? And it is not in Canada alone that this scene is being witnessed. Four other colonies are at this moment occupied as we are — declaring their hearty love for the parent State, and deliberating with us how they may best discharge the great duty entrusted to their hands, and give their aid in developing the teeming resources of these vast possessions. And well, Mr. SPEAKER, may the work we have unitedly proposed rouse the ambition and energy of every true man in British America. Look, sir, at the map of the continent of America, and mark that island (Newfoundland) commanding the mouth of the noble river that almost cuts our continent in twain. Well, sir, that island is equal in extent to the kingdom of Portugal. Cross the straits to the main land, and you touch the hospitable shores of Nova Scotia, a country as large as the kingdom of Greece. Then mark the sister province of New Brunswick — equal in extent to Denmark and Switzerland combined. Pass up the river St. Lawrence to Lower Canada — a country as large as France. Pass on to Upper Canada, — twenty thousand square miles larger than Great Britain and Ireland put together. Cross over the continent to the shores of the Pacific, and you are in British Columbia, the land of golden promise, — equal in extent to the Austrian Empire. I speak not now of the vast Indian Territories that lie between greater in extent than the whole soil of Russia — and that will ere long, I trust, be opened up to civilization under the auspices of the British American Confederation. (Cheers.) Well, sir, the bold scheme in your hands is nothing less than to gather all these countries into one — to organize them all under one government, with the protection of the British flag, and in heartiest sympathy and affection with our fellow-subjects in the land that gave us birth. (Cheers.) Our scheme is to establish a government that will seek to turn the tide of European emigration into this northern half of the American continent — that will strive to develop [sic] its great natural resources — and that will endeavor to maintain liberty, and justice, and christianity throughout the land. MR. T. C. WALLBRIDGE — When? HON. MR. CARTIER — Very soon! HON. MR. BROWN — The hon. member for North Hastings asks when all this can be done? Sir, the whole great ends of this Confederation may not be realized in the lifetime of many who now hear me. We imagine not that such a structure can be built in a month or in a year. What we propose now is but to lay the foundations of the structure — to set in motion the governmental machine that will one day, we trust, extend from the Atlantic to the Pacific. And we take especial credit to ourselves that the system we have devised, while admirably adapted to our present situation, is capable of gradual and efficient expansion in future years to meet all the great purposes contemplated by our scheme. But if the honorable gentleman will only recall to mind that when the United States seceded from the Mother Country, and for many years afterwards their population was not nearly equal to ours at this moment; that their internal improvements did not then approach to what we have already attained; and that their trade and commerce was not then a third of what ours has already reached; I think he will see that the fulfilment of our hopes may not be so very remote as at first sight might be imagined — (hear, hear.) And he will be strengthened in that conviction if he remembers that what we propose to do is to be done with the cordial sympathy and assistance of that great Power of which it is our happiness to form a part. (Hear, hear.) Such, Mr. SPEAKER, are the objects of attainment to which the British American Conference pledged itself in October. I see an honorable friend now before me, for whose opinions I have the very highest respect, who says to me : " Mr. BROWN, you should not have settled this part of the plan as you have done ; here is the way you should have framed it." "Well, my dear sir," is my reply, "I perfectly agree with you, but it could not be done. Whether we ask for parliamentary reform for Canada alone or in union with the Maritime Provinces, the French Canadians must have their views consulted as well as us. This scheme can be carried, and no scheme can be that has not the support of both sections of the province." Hon. Mr. CARTIER — Hear, hear! there is the question! Hon. Mr. BROWN — Yes, that is the question and the whole question. No constitution ever framed was without defect; no act of human wisdom was ever free from imperfection; no amount of talent and wisdom and integrity combined in preparing such a scheme could have placed it beyond the reach of criticism. And the framers of this scheme had immense special difficulties to overcome. We had the prejudices of race and language and religion to deal with; and we had to encounter all the rivalries of trade and commerce, and all the jealousies of diversified local interests. To assert, then, that our scheme is without fault, would be folly. It was necessarily the work of concession; not one of the thirty-three framers but had, on some points, to yield his opinions; and, for myself, I freely admit that I struggled earnestly, for days together, to have portions of the scheme amended. But, Mr. SPEAKER, admitting all this — admitting all the difficulties that beset us — admitting frankly that defects in the measure exist — I say that, taking the scheme as a whole, it has my cordial, enthusiastic support, without hesitation or reservation. (Hear, hear.) I believe it will accomplish all, and more than all, that we, who have so long fought the battle of parliamentary reform, ever hoped to see accomplished. I believe that, while granting security for local interests, it will give free scope for carrying out the will of the whole people in general matters — that it will draw closer the bonds that unite us to Great Britain — and that it will lay the foundations deep and strong of a powerful and prosperous people. (Cheers.) And if the House will allow me to trespass to a somewhat unusual degree on its indulgence, I am satisfied that I can clearly establish that such are the results fairly to be anticipated from the measure. Mr. SPEAKER, there are two views in which this scheme may be regarded, namely, the existing evils it will remedy, and the new advantages it will secure for us as a people. Let us begin by examining its remedial provisions. MR. T. C. WALLBRIDGE — Hear, hear! But it has been said that the members of the Upper House ought not to be appointed by the Crown, but should continue to be elected by the people at large. On that question my views have been often expressed. I have always been opposed to a second elective chamber, and I am so still, from the conviction that two elective houses are inconsistent with the right working of the British parliamentary system. I voted, almost alone, against the change when the Council was made elective, but I have lived to see a vast majority of those who did the deed wish it had not been done. It is quite true, and I am glad to acknowledge it, that many evils anticipated from the change, when the measure was adopted, have not been realized. (Hear, hear.) I readily admit that men of the highest character and position have been brought into the Council by the elective system, but it is equally true that the system of appointment brought into it men of the highest character and position. Whether appointed by the Crown or elected by the people, since the introduction of parliamentary government, the men who have composed the Upper House of this Legislature have been men who would have done honor to any legislature in the world. But what we most feared was, that the Legislative Councillors would be elected under party responsibilities; that a partisan spirit would soon show itself in the chamber; and that the right would soon be asserted to an equal control with this House over money bills. That fear has not been realised to any dangerous extent. But is it not possible that such a claim might ere long be asserted? Do we not hear, even now, mutterings of a coming demand for it? Nor can we forget that the elected members came into that chamber gradually; that the large number of old appointed members exercised much influence in maintaining the old forms of the House, the old style of debate, and the old barriers against encroachment on the privileges of the commons. But the appointed members of the Council are gradually passing away, and when the elective element becomes supreme, who will venture to affirm that the Council would not claim that power over money bills which this House claims as of right belonging to itself? Could they not justly say that they represent the people as well as we do, and that the control of the purse strings ought, therefore, to belong to them as much as to us. (Hear, hear.) It is said they have not the power. But what is to prevent them from enforcing it? Suppose we had a conservative majority here, and a reform majority above or a conservative majority above an a reform majority here — all elected under party obligations, — what is to prevent a dead-lock between the chambers? It may be called unconstitutional — but what is to prevent the Councillors (especially if they feel that in the dispute of the hour they have the country at their back) from practically exercising all the powers that belong to us? They might amend our money bills, they might throw out all our bills if they liked, and bring to a stop the whole machinery of government. And what could we do to prevent them? But, even supposing this were not the case, and that the elective Upper House continued to be guided by that discretion which has heretofore actuated its proceedings, — still, I think, we must all feel that the election of members for such enormous districts as form the constituencies of the Upper House has become a great practical inconvenience. I say this from personal experience, having long taken an active interest in the electoral contests in Upper Canada. We have found greater difficulty in inducing candidates to offer for seats in the Upper House, than in getting ten times the number for the Lower House. The constituencies are so vast, that it is difficult to find gentlemen who have the will to incur the labor of such a contest, who are sufficiently known and popular enough throughout districts so wide, and who have money enough — (hear) — to pay the enormous bills, not incurred in any corrupt way, — do not fancy that I mean that for a moment — but the bills that are sent in after the contest is over, and which the candidates are compelled to pay if they ever hope to present themselves for re-election. (Hear, hear.) But honorable gentlemen say — "This is all very well, but you are taking an important power out of the hands of the people, which they now possess." Now this is a mistake. We do not propose to do anything of the sort. What we propose is, that the Upper House shall be appointed from the best men of the country by those holding the confidence of the representatives of the people in this Chamber. It is proposed that the Government of the day, which only lives by the approval of this Chamber, shall make the appointments, and be responsible to the people for the selections they shall make. (Hear, hear.) Not a single appointment could be made, with regard to which the Government would not be open to censure, and which the representatives of the people, in this House, would not have an opportunity of condemning. For myself, I have maintained the appointed principle, as in opposition to the elective, ever since came into public life, and have never hesitated, when before the people, to state my opinions in the broadest manner; and yet not in a single instance have I ever found a constituency in Upper Canada, or a public meeting declaring its disapproval of appointment by the Crown and its desire for election by the people at large. When the change was made in 1855 there was not a single petition from the people asking for it — it was in a manner forced on the Legislature. The real reason for the change was, that before Responsible Government was introduced into this country, while the old oligarchical system existed, the Upper House continuously and systematically was at war with the popular branch, and threw out every measure of a liberal tendency. The result was, that in the famous ninety-two resolutions the introduction of the elective principle into the Upper House was declared to be indispensable. So long as Mr. ROBERT BALDWIN remained in public life, the thing could not be done; but when he left, the deed was consummated. But it is said, that if the members are to be appointed for life, the number should be unlimited that, in the event of a dead lock arising between that chamber and this, there should be power to overcome the difficulty by the appointment of more members. Well, under the British system, in the case of a legislative union, that might be a legitimate provision. But honorable gentlemen must see that the limitation of the numbers in the Upper House lies at the base of the whole compact on which this scheme rests. (Hear, hear.) It is perfectly clear, as was contended by those who represented Lower Canada in the Conference, that if the number of the Legislative Councillors was made capable of increase, you would thereby sweep away the whole protection they had from the Upper Chamber. If there is one evil in the American system which in my mind stands out as pre-eminently [sic] its greatest defect, except universal suffrage, it is that under that Constitution the representatives of the people must reside in the constituencies for which they sit. (Hear, hear.) The result is that a public man, — no matter what his talent, or what his position — no matter how necessary it may be for the interest of the country that he should be in public life, unless he happens to belong to the political party popular for the time being in the constituency where he resides, cannot possibly find a seat in Congress. And over and over again have we seen the very best men of the Republic, the most illustrious names recorded in its political annals, driven out of the legislature of their country, simply because the majority in the electoral division in which they lived was of a different political party from them. I do think the British system infinitely better than that, securing as it does that public men may be trained to public life, with the assured conviction that if they prove themselves worthy of public confidence, and gain a position in the country, constituencies will always be found to avail themselves of their services, whatever be the political party to which they may adhere. You may make politicians by the other, but assuredly this is the way that statesmen are produced. HON. MR. DORION — Ha! ha! HON. MR. BROWN — My honorable friend laughs, but I assure him, and he will not say I do so for the purpose of deceiving him, that having been present in Conference and in Council, having heard all the discussions and well ascertained the feelings of all associated with me, I have not a shadow of a doubt on my mind that full justice will be done in the selection of the first Federal Councillors, not only to those who may have been in the habit of acting with me, but also to those who have acted with my honorable friend the member for Hochelaga. (Hear, hear.) Now, Mr. SPEAKER, I believe I have answered every objection that has come from any quarter against the proposed constitution o the Federal Legislature. I am persuaded there is not one well-founded objection that can be urged against it. It is just to all parties; it remedies the gross injustice of the existing system; and I am convinced it will not only work easily and safely, but be entirely satisfactory to the great mass of our people. "We in Upper Canada have complained that though we paid into the public treasury more than three- fourths of the whole revenue, we had less control over the system of taxation and the expenditure of the public moneys than the people of Lower Canada. Well, sir, the scheme in your hand remedies that. The absurd line of separation between the provinces is swept away for general matters; we are to have seventeen additional members in the house that holds the purse." But, Mr. SPEAKER, the second feature of this scheme as a remedial measure is, that it removes, to a large extent, the injustice of which Upper Canada has complained in financial matters. We in Upper Canada have complained that though we paid into the public treasury more than three- fourths of the whole revenue, we had less control over the system of taxation and the expenditure of the public moneys than the people of Lower Canada. Well, sir, the scheme in your hand remedies that. The absurd line of separation between the provinces is swept away for general matters; we are to have seventeen additional members in the house that holds the purse; and the tax-payers of the country, wherever they reside, will have their just share of influence over revenue and expenditure. (Hear, hear.) We have also complained that immense sums of public money have been systematically taken from the public chest for local purposes of Lower Canada, in which the people of Upper Canada had no interest whatever, though compelled to contribute three-fourths of the cash. But, sir, I am told that though true it is that local matters are to be separated and the burden of local expenditure placed upon local shoulders, we have made an exception from that principle in providing that a subsidy of eighty cents per head shall be taken from the federal chest and granted to the local governments for local purposes. Undoubtedly this is the fact — and I do not hesitate to admit that it would have been better if this had been otherwise. I trust I commit no breach of discretion in stating that in Conference I was one of the strongest advocates for defraying the whole of the local expenditures of the local governments by means of direct taxation, and that there were liberal men in all sections of the provinces who would gladly have had it so arranged. But I apprehend that if we did not succeed in putting this matter on the footing that would have been the best, at least we did the next best thing. Two courses were open to us — either to surrender to the local governments some source of indirect revenue, some tax which the General Government proposed to retain, — or collect the money by the federal machinery, and distribute it to the local governments for local purposes. And we decided in favor of the latter. We asked the representatives of the different governments to estimate how much they would require after the inauguration of the federal system to carry on their local machinery. As at first presented to us, the annual sum required for all the provinces was something like five millions of dollars — an amount that could not possibly have been allotted. The great trouble was that some of the governments are vastly more expensive than others — extensive countries, with sparse populations, necessarily requiring more money per head for local government than countries more densely populated. But as any grant given from the common chest, for local purposes, to one province, must be extend to all, on the basis of population, it follows that for every $1,000 given, for example, to New Brunswick, we must give over $1,300 to Nova Scotia, $4,000 to Lower Canada, and $6,000 to Upper Canada — thereby drawing from the federal exchequer much large sums than these provinces needed for local purposes. The course we adopted then was this: We formed a committee of Finance Ministers and made each of them go over his list of expenditures, lopping off unnecessary services and cutting down every item to the lowest possible figure. By this means we succeeded in reducing the total annual subsidy required for local government to the sum of $2,630,000 of which Lower Canada will receive annually $880,000, and Upper Canada $1,120,000. A similar arrangement was found necessary as regards the Island of Newfoundland — it, too, being a vast country with a sparse population. It was found absolutely essential that an additional grant beyond eighty cents per head should be made to enable her Local Government to be properly carried on. But, in consideration of this extra allowance, Newfoundland is to cede to the Federal Government her Crown lands and minerals — and assuredly , if the reports of geologists are well founded, this arrangement will be as advantageous to us as it will be to the inhabitants of Newfoundland. We have complained that local works of various kinds — roads, bridges and landing piers, court houses, gaols and other structures — have been erected in an inequitable and improvident manner. Well, sir, this scheme remedies that; all local works are to be constructed by the localities and defrayed from local funds. And so on through the whole extensive details of internal local administration will this reform extend. The people of Upper Canada will have the entire control of their local matters, and will no longer have to betake themselves to Quebec for leave to open a road, to select a county town, or appoint a coroner. 6. Education; saving the rights and privileges which the Protestant or Catholic minority in both Canadas may possess as to their Denominational Schools at the time when the Union goes into operation. Now, I need hardly remind the House that I have always opposed and continue to oppose the system of sectarian education, so far as the public chest is concerned. I have never had any hesitation on that point. I have never been able to see why all the people of the province, to whatever sect they may belong, should not send their children to the same common schools to receive the ordinary branches of instruction. I regard the parent and the pastor as the best religious instructors — and so long as the religious faith of the children is uninterfered [sic] with, and ample optunity [sic] afforded to the clergy to give religious instruction to the children of their flocks, I cannot conceive any sound objection to mixed schools. But while in the Conference and elsewhere I have always maintained this view, and always given my vote against sectarian public schools, I am bound to admit, as I have always admitted, that the sectarian system, earned to the limited extent it has yet been in Upper Canada, and confined as it chiefly is to cities and towns, has not been a very great practical injury. The real cause of alarm was that the admission of the sectarian principle was there, and that at any moment it might be extended to such a degree as to split up our school system altogether. There are but a hundred separate schools in Upper Canada, out of some four thousand, and all Roman Catholic. But if the Roman Catholics are entitled to separate schools and to go on extending their operations, so are the members of the Church of England, the Presbyterians, the Methodists, and all other sects. No candid Roman Catholic will deny this for a moment; and there lay the great danger to our educational fabric, that the separate system might gradually extend itself until the whole country was studded with nurseries of sectarianism, most hurtful to the best interests of the province, and entailing an enormous expense to sustain the hosts of teachers that so prodigal a system of public instruction must inevitably entail. Now it is known to every honorable member of this House that an Act was passed in 1863, as a final settlement of this sectarian controversy. I was not in Quebec at the time, but if I had been here I would have voted against that bill, because it extended the facilities for establishing separate schools. It had, however, this good feature, that it was accepted by the Roman Catholic authorities, and carried through Parliament as a final compromise of the question in Upper Canada. When, therefore, it was proposed that a provision should be inserted in the Confederation scheme to bind that compact of 1863 and declare it a final settlement, so that we should not be compelled, as we have been since 1849, to stand constantly to our arms, awaiting fresh attacks upon our common school system, the proposition seemed to me one that was not rashly to be rejected. (Hear, hear.) I admit that, from my point of view, this is a blot on the scheme before the House, it is, confessedly, one of the concessions from our side that had to be made to secure this great measure of reform. But assuredly, I, for one, have not the slightest hesitation in accepting it as a necessary condition of the scheme of union, and doubly acceptable must it be in the eyes of honorable gentlemen opposite, who were the authors of the bill of 1863. (Cheers.) But it was urged that though this arrangement might perhaps be fair as regards Upper Canada, it was not so as regards Lower Canada, for there were matters of which the British population have long complained, and some amendments to the existing School Act were required to secure them equal justice. Well, when this point was raised, gentlemen of all parties in Lower Canada at once expressed themselves prepared to treat it in a frank and conciliatory manner, with a view to removing any injustice that might be shown to exist; and on this understanding the educational clause was adopted by the Conference. MR. T. C. WALLBRIDGE — That destroys the power of the local legislatures to legislate upon the subject. But, Mr. SPEAKER, I am further in favor of this scheme because it will bring to an end the sectional discord between Upper and Lower Canada. It sweeps away the boundary line between the provinces so far as regards matters common to the whole people — it places all on an equal level — and the members of the Federal Legislature will meet at last as citizens of a common country. The questions that used to excite the most hostile feelings among us have been taken away from the General Legislature, and placed under the control of the local bodies. No man need hereafter be debarred from success in public life because his views, however popular in his own section, are unpopular in the other, — for he will not have to deal with sectional questions; and the temptation to the Government of the day to make capital out of local prejudices will be greatly lessened, if not altogether at an end. But, Mr. SPEAKER, so far from the objections urged against union with the Maritime Provinces being sound, so far from union with them being a drawback to this measure, I regard it as the crowning advantage of the whole scheme. (Continued cheering.) Sir, I make no pretension to having been in past years an advocate of the immediate union of the British American Colonies. I always felt and always said that no statesman could doubt that such was the best and almost the certain future destiny of these colonies; but I doubted greatly whether the right time for the movement had yet arrived. I knew little of the Maritime Provinces or the feelings of their people; the negotiations for a union were likely to be difficult and long protracted, and I was unwilling to accept the hope of a measure so remote and so uncertain in lieu of the practical remedy for practical evils in Canada which we were earnestly seeking to obtain, and which our own Legislature had the power immediately to grant. HON. MR. HOLTON — What has put them down since? But secondly, Mr. SPEAKER, I go heartily for the union, because it will throw down the barriers of trade and give us the control of a market of four millions of people. (Hear, hear.) What one thing has contributed so much to the wondrous material progress of the United States as the free passage of their products from one State to another? What has tended so much to the rapid advance of all branches of their industry, as the vast extent of their home market, creating an unlimited demand for all the commodities of daily use, and stimulating the energy and ingenuity of producers? Sir, I confess to you that in my mind this one view of the union — the addition of nearly a million of people to our home consumers sweeps aside all the petty objections that are averred against the scheme. What, in comparison with this great gain to our farmers and manufacturers, are even the fallacious money objections which the imaginations of honorable gentlemen opposite have summoned up? All over the world we find nations eagerly longing to extend their domains, spending large sums and waging protracted wars to themselves of more territory, untilled and uninhabited. (Hear, hear.) Other countries offer large inducements to foreigners to emigrate to their shores — free passages, free lands, and free food and implements to start them in the world. We, ourselves, support costly establishments to attract immigrants to our country, and are satisfied when our annual outlay brings us fifteen or twenty thousand souls. But here, sir, is a proposal which is to add, in one day, near a million of souls to our population — to add valuable territories to our domain, and secure to us all the advantages of a large and profitable commerce, now existing. And because some of us would have liked certain of the little details otherwise arranged, we are to hesitate in accepting this alliance! (Hear, hear.) Have honorable gentlemen forgotten that the United States gladly paid twenty millions in hard cash to have Louisiana incorporated in the Republic? But what was Louisiana then to the Americans, in comparison with what the Maritime Provinces are at this moment to Canada? I put it to honorable gentlemen opposite — if the United States were now to offer us the State of Maine, what possible sum could be named within the compass of our ability that we would not be prepared to pay for that addition to our country? (Hear, hear.) If we were offered Michigan, Iowa or Minnesota, I would like to know what sum within the compass of Canada, we would not be prepared to pay? These are portions of a foreign country, but here is a people owning the same allegiance as ourselves, loving the same old sod, enjoying the same laws and institutions, actuated by the same impulses and social customs, — and yet when it is proposed that they shall unite with us for purposes of commerce, for the defence of our common country, and to develope [sic] the vast natural resources of our united domains, we hesitate to adopt it! If a Canadian goes now to Nova Scotia or New Brunswick, or if a citizen of these provinces comes here, it is like going to a foreign country. The customs officer meets you at the frontier, arrests your progress, and levies his imposts on your effects. But the proposal now before us is to throw down all barriers between the provinces — to make a citizen of one, citizen of the whole; the proposal is, that our farmers and manufacturers and mechanics shall carry their wares unquestioned into every village of the Maritime Provinces; and that they shall with equal freedom bring their fish, and their coal, and their West India produce to our three millions of inhabitants. The proposal is, that the law courts, and the schools, and the professional and industrial walks of life, throughout all the provinces, shall be thrown equally open to us all. (Hear, hear). HON. MR. HOLTON — How much of the shipping built in that year do we own now? HON. MR. HOLTON — Don't! HON. MR. BROWN — Ah! my honorable friend does not require to be instructed; well, will he tell us how many tons of shipping are now owned by British America? HON. MR. HOLTON — I am aware that most of the vessels my honorable friend speaks of, and the building of which he cites as a proof that we will be a great maritime power, were sold abroad. Building ships is a good thing, and selling them is a better, but that does not prove us to be a great maritime power. HON. MR. BROWN — My honorable friend cannot eat his cake and have it too. If we got $9,000,000 for a portion of the ships we built in 1863, it is clear we cannot own them also. It did not require a man of great wisdom to find out that. (Laughter.) But I was going on to show the amount of shipping that was owned in these provinces. hold in my hand a statement of the vessels owned an registered in British America, made up to the latest dates, and I find that the provinces unitedly own not fewer than 8,530 vessels, with an aggregate tonnage of not less than 932,246 tons. HON. MR. HOLTON — Sea-going ? HON. MR. BROWN — Sea-going and inland. HON. MR. HOLTON — (ironically) — Hear, hear! Now, sir, the United States are in the same position as we are in respect to this inland traffic, and they include it in their returns as is done here. And what, sir, do you think is the difference between their tonnage and ours? Why ours is over twelve millions and theirs is but sixteen millions. There are not four millions of tons of difference between the two. (Hear, hear.) And let it be recollected that the United States have had seventy years start of us. As regards France, the whole amount of shipping that entered and left the ports of that great country in one year was but 8,456,734 tons four millions of tons less than that of the British American Provinces. May we not then, when this union is accomplished, fairly claim to be the third maritime state of the world; and may we not even entertain the hope that, at some future day, a still higher position is not beyond our reach, when the days of puberty have been passed and the strength of manhood has been reached? HON. MR. HOLTON — Unfortunately for your argument, the lands will be in the hands of the local governments. The communications with the North-Western Territory, and the improvements required for the development of the trade of the Great West with the seaboard are regarded by this Conference as subjects of the highest importance to the Federated Provinces, an shall be prosecuted at the earliest possible period that the state of the finances will permit. The Confederation is, therefore, clearly committed to the carrying out of both these enterprises. I doubt if there was a member of the Conference who did not consider that the Opening up of the North-West and the improvement of our canal system, were not as clearly for the advantage of the Lower Provinces as for the interests of Upper Canada. Indeed, one gentleman held that the Lower Provinces were more interested — they wished to get their products into the west — they wanted a back country as much as we did — they wanted to be the carriers for that great country — and they were, therefore, to say the least, as much interested in these questions as we were. But honorable gentlemen lay stress upon the point, that, while the one enterprise is to be undertaken at once, the other is not to be commenced until the state of the finances will permit. No doubt this is corrects, and the reason for it is simply this — the money has already been found for the Inter- colonial Railway. They must be well aware that the late Government (the MACDONALD-SICOTTE Administration) agreed to build the Intercolonial Railway, and obtained from the Imperial Government a guarantee of the debentures for building it — so that that money is ready at a very low rate of interest, whenever required. We know where to find the money for one enterprise at a rate we are able to bear, and can thus at once go on with a work which must be gone on with if this union is to be consummated. But we don't know this of the other great work — and we all felt that it would be exceedingly indiscreet — I, myself, as the special advocate of opening up the Great West and of the enlargement of our canals, — felt that I could not put my name to a document which declared that at all hazards, while our five per cent. debentures were quoted at 75 or 80 per cent. in the money market — we would commence at once, without an hour's delay, any great public work whatever. (Hear, hear.) Honorable gentlemen opposite must not imagine that they have to do with a set of tricksters in the thirty-three gentlemen who composed that Conference. What we have said in our resolutions was deliberately adopted, in the honest sense of the words employed, and not for purposes of deception. Both works are to go on at the earliest possible moment our finances will permit, and honorable gentlemen will find the members of the Cabinet from Lower, as well as from Upper Canada, actuated by the hearty desire to have this whole scheme carried out in its fair meaning. HON. MR. CARTIER — Hear, hear! HON. MR. GALT — Hear, hear! While speaking on this question of immigration, I would remind the House, and it is impossible to urge it too strongly, that these provinces are now presented to the world in a very disadvantageous aspect, as different communities. When a party in Europe thinks of emigrating here, he has to ascertain separately all about New Brunswick, and Prince Edward Island, and Nova Scotia, and Upper and Lower Canada; and if by chance he meets a party from some one of these provinces, he has to listen to a picture of the merits of that one section in high contrast to the demerits of all the rest, and the result is the poor man's ideas about us become a mass of confusion. On the other hand, if he seeks to know the inducements for emigration to New South Wales, or New Zealand, he gets it in one picture — in an official form — and the offer is made to pay his passage to these lands of hope. A large amount of emigration, and of money which the emigrant takes with him, are thus carried off to a much more distant land than this, and one that does not offer equal inducements to the settler. But how different will all this be when these provinces stand united, and present to emigrants a combination of so many branches of profitable industry? In turning over some United States statistics I recently fell upon a very curious official calculation made by the United States Government, as to the value of immigration. By the census of 1861 the population of the United States was over thirty millions; and this calculation was to ascertain what the population would have been had there been no immigration into the country, but had the population been left to advance solely by its own natural increase. And what do you think, sir, was the result? Why, it is shewn that if the United States had received all the immigrants that came to them up to 1820, and then stopped receiving them — the population, at this moment, instead of thirty millions, would have been but 14,601,485. (Hear, hear.) It is shewn that if immigration had gone on until 1810 and stopped then, the population now would have been only 12,678,562. Had it stepped in 1800, the population now would have been 10,462,944; and had it stopped in 1790, the population now, instead of thirty millions, would have been but 8,789,969. (Hear, hear.) These, sir, are most valuable facts, which should be impressed on the mind of every public man in British America. If we wish our country to progress, we should not leave a single stone unturned to attract the tide of emigration in this direction; and I know no better method of securing that result, than the gathering into one of these five provinces, and presenting ourselves to the world in the advantageous light which, when united, we would occupy. (Cheers) But, fifthly, Mr. SPEAKER, I am in favor of a union of these provinces, because it will enable us to meet, without alarm, the abrogation of the American Reciprocity Treaty, in case the United States should insist on its abolition. (Hear, hear.) I do not believe that the American Government is so insane as to repeal that treaty. But it is always well to be prepared for contingencies — and I have no hesitation in saying that if they do repeal it, should this union of British America go on, a fresh 'outlet for our commerce will be opened up to us quite as advantageous as the American trade has ever been. I have never heretofore ventured to make this assertion, for I know well what a serious task it is to change, in one day, the commercial relations of such a country as this. When the traffic of a country has passed for a lengthened period through a particular channel, any serious change of that channel tends, for a time, to the embarrassment of business men, and causes serious injury to individuals, if not to the whole community. Such a change we in Canada had in 1847. But as it was in 1847, so it will be in 1866, if the Reciprocity Treaty is abolished. Our agricultural interest had been built up on the protective legislation of Great Britain, and in 1847 it was suddenly brought to an end. We suffered severely, in consequence, for some years; but, by degrees, new channels for our trade opened up — the Reciprocity Treaty was negotiated — and we have more prosperous since 1847 than we ever were before. And so, I have not a doubt, will it be in the event of the Reciprocity Treaty being abolished. Profitable as that treaty has unquestionably been to us — and it has been more profitable to the Americans — still, were it brought to an end to-morrow, though we would suffer a while from the change, l am convinced the ultimate result would be that other foreign markets would be opened to us, quite as profitable, and that we would speedily build up our trade on a sounder basis than at present. But, coupled with this, was the invariable and most reasonable declaration that a share of the burden of defence, in peace and in war, we must contribute. And this stipulation applies not only to Canada, but to every one of the colonies. Already the Indian Empire has been made to pay the whole expense of her military establishment. The Australian Colonies have agreed to pay £40 sterling per man for every soldier sent there. This system is being gradually extended — and union or no union, assuredly every one of these British American Colonies will be called upon to bear her fair share towards the defence of the Empire. And who will deny that it is a just demand, and that great colonies such as these, should be proud to meet it in a frank and earnest spirit. (Cheers.) Nothing, I am persuaded, could be more foreign to the ideas of the people of Canada, than that the people of England should be unfairly taxed for service rendered to this province. Now, the question presented to us is simply this : will these contributions which Canada and the other provinces must hereafter make to the defence of the Empire, be better rendered by a hardy, energetic, population, acting as one people, than as five or six separate communities? (Hear, hear.) There is no doubt about it. But not only do our changed relations towards the Mother Country call on us to assume the new duty of military defence — our changed relations towards the neighboring Republic compel us to do so. For myself, I have no belief that the Americans have the slightest thought of attacking us. I cannot believe that the first use of their newfound liberty will be the invasion, totally unprovoked, of a peaceful province. I fancy that they have had quite enough of war for a good many years to come — and that such a war as one with England would certainly be, is the last they are likely to provoke. But, Mr. SPEAKER, there is no better mode of warding off war when it is threatened, than to be prepared for it if it comes. The Americans are now a warlike people. They have large armies, a powerful navy, an unlimited supply of warlike munitions, and the carnage of war has to them been stript of its horrors. The American side of our lines already bristles with works of defence, and unless we are willing to live at the mercy of our neighbors, we, too, must put our country in a state of efficient preparation. War or no war — the necessity of placing these provinces in a thorough state of defence can no longer be postponed. With the body of efficient soldiers that might be obtained from this vast array of men, the erection of defensive works at salient points, and the force of British troops that would soon come to our aid — who can doubt that the invasion of our country would be successfully resisted? But, seventhly, Mr. SPEAKER, I am in favor of this union because it will give us a sea-board at all seasons of the year. (Hear, hear.) It is not to be denied that the position of Canada, shut off as she is from the sea-board during the winter months, is far from satisfactory — and should the United States carry out their insane threat of abolishing the bonding system, by which our merchandise passes free through their territory, it would be still more embarrassing. The Maritime Provinces are equally cut off from communication inland. Now, this embarrassment will be ended by colonial union. The Inter-colonial Railway will give us at all times access to the Atlantic through British territory. (Hear, hear.) As a commercial enterprise, the Intercolonial Railway has not, I apprehend, any considerable merit; as a work of defence it has, however, many advocates; but, if the union of the provinces is to go on, it is an absolute necessity; and, as the price of union, were there no other argument' m its favor, I heartily go for it. (Hear, hear.) The advantage it will confer on the Maritime Provinces can hardly be over-rated. It will make Halifax and St. John the Atlantic seaports of half a continent — it will insure to Halifax, ere long, the establishment of a line of powerful steamers running in six days from her wharves to some near point on the west coast of Ireland — and it will bring a constant stream of passengers and immigrants through those Lower Provinces that never otherwise would come near them. "The advantage [the Intercolonial Railway] will confer on the Maritime Provinces can hardly be over-rated. It will make Halifax and St. John the Atlantic seaports of half a continent... and it will bring a constant stream of passengers and immigrants through those Lower Provinces that never otherwise would come near them." Mr. SPEAKER, I could go on for many hours piling up arguments in favor of this scheme, but already I have detained the House too long — (cries of "no, no;" "go on!") — and must draw to a close. But I think I have given reasons enough to satisfy every candid man who desires the advancement of his country, why this House should go unanimously and enthusiastically for " the union, the whole union, and nothing but the union!" Before sitting down, however, there are one or two general objections urged against the scheme which I am desirous of meeting, and I will try to do so as briefly as possible. And first, sir, I am told that we should have made the union legislative and not federal. Undoubtedly this is a point on which different opinions may be honestly held by men sincerely seeking the same ends — but, speaking my own views, I think we came to a most wise conclusion. Had we continued the present legislative union, we must have continued with it the unjust system of taxation for local purposes that now exists — and the sectional bickering would have gone on as before. And can any honorable gentleman really believe that it would have been possible for a body of men sitting at Ottawa to administer efficiently and wisely the parish business of Red River and Newfoundland, and all the country between? Only think of bringing suitors and witnesses such distances to promote a bill for closing. a side-line or incorporating a club! And if such a thing were desirable, would it be possible for any body of men to go through such a mass of work? Why, sir, the Imperial Parliament with 650 members sits for eight months in the year, and even our Parliament sits three or four months, — how then would it be possible for the legislature of all the Provinces with a thousand or twelve hundred bills before it, to accomplish it all? The whole year would not suffice for it — and who in these colonies is able to sacrifice his whole time to the duties of public life? But there is another reason why the union was not made legislative — it could not be carried. (Hear, hear.) We had either to take a federal union or drop the negotiation. Not only were our friends from Lower Canada against it, but so were most of the delegates from the Maritime Provinces. There was but one choice open to us — federal union or nothing. But, Mr. SPEAKER, I am told that the cost of working this Federation scheme will be enormous. Now, it would be a very rash thing of me, or of any other person, to assert that the expense will not be great ; for we all know that any system of government may be made either economical or extravagant, precisely according to the discretion of those who administer it. But this I am confident of, that with ordinary discretion, far from being more costly than the existing system, a very considerable reduction may be readily effected; and one thing is quite certain, that no ingenuity could make it a more costly or extravagant system than the one we have now. (Loud cries of hear, hear.) Undoubtedly the mode in which the local governments shall be constructed will very much affect the cost of the whole scheme; but if we adopt (as I earnestly hope we will) simple and inexpensive machinery for local purposes, I am quite satisfied that there will a reduction to the people of Canada on the amount they now contribute. I have great confidence in the economical effect of placing local expenditures on local shoulders, and in the salutary influence in the same direction, of the representatives of the Maritime Provinces when they come among us. HON. MR. HOLTON — The trouble is that they will spend our money — not theirs. HON. MR. BROWN — The honorable gentleman is entirely wrong, and I am amazed at his making such a statement. There is no portion of the community that will pay more money, per head, to the revenue than the people of the Maritime Provinces. If the honorable gentleman had turned up the commercial returns of those Lower Provinces and calculated the effect of our tariff, if applied to them — or even a tariff less than ours, for our tariff must be reduced, he would have known that they will bear their full proportion of the national burdens. (Hear, hear.) But, Mr. SPEAKER, I am told that the arrangement as to the debt is unfair — that we have thrown on the Federal exchequer the whole of the debts of the Maritime Provinces, but only a portion of the debt of Canada. There is not a particle of force in this objection. The whole debt of Canada is $67,500,000, but five millions of this is due to our own people, to meet which there are certain local funds. Now, if we had thrown the whole $67,500,000 on the Federal treasury, we must also have handed over to it the local revenues, which, so far as these five millions are concerned, would have been precisely the same thing. But, as regards the public debt with which the Federal Government would start, it would not have been the same thing. By restricting the debt of Canada to $62,500,000, we restricted the debt of the Maritime Provinces to the same proportion, or $25 per head of their population; but had we thrown our whole debt of sixty-seven and a half millions on the Confederation, the proportion of debt for the several Maritime Provinces must have been increased, and the whole debt very greatly augmented. (Hear.) But in throwing these five millions on the local governments of Upper and Lower Canada, do we impose a burden on them they are unable to bear? Quite the contrary — for with the debt, we give them the corresponding sources of revenue from which to meet it. The local governments of Upper and Lower Canada will severally not only have funds from the subsidy and other sources, to meet all expenditure, but a large surplus besides. But, Mr. SPEAKER, I am told that this Federation scheme may be all very right — it may be just and the very thing the country needs — but this Government had no authority from Parliament to negotiate it. The honorable member for Cornwall (Hon. JOHN S. MACDONALD) particularly pressed this objection, and I am sorry he is not in his seat. HON. MR. HOLTON — It is quite true. HON. MR. CARTIER — No, the reverse is true. HON. MR. BROWN — I am astonished to hear such a statement repeated. No one knows better than the honorable member for Chateauguay and the honorable member for Cornwall that in the Ministerial explanations brought down to this House, at the time of the formation of this Government, it was distinctly declared that the Government it was formed for the initial purpose of maturing a scheme of Federal union, and that it would take means, during the recess, for opening negotiations with the Maritime Provinces, to bring about such a union. HON. MR. HOLTON — But not to conclude them. MR. DUNKIN — And I heard something more said — that nothing should be done which did not leave the House perfectly free. HON. MR. BROWN — I can assure my honorable friend that, as far as that goes, he never was more free in his life than now. (Laughter.) We do not pretend to say that anything we have done binds this House; any member may object if he pleases; but I do say we received the approval of the House for opening negotiations, and it is a miserable pretence to say anything to the contrary. (Hear, hear.) We did no more than has been done by every Government, under the British system, that ever existed. We have but made a compact, subject to the approval of Parliament. So far as this Government is concerned, we are firmly committed to the scheme; but so far as the members of the Legislature are concerned, they are as free as air; but I am confident that this House will almost unanimously accept it, and not with changes and amendments, but as a whole — as the very best compromise arrangement that can be obtained. HON. MR. HOLTON — We have not the treaty-making power. HON. MR. BROWN — I remember a Government formed from that side of the House, and the honorable member for Hochelaga (Hon. Mr. DORION) will remember it too, which made a treaty respecting the building of the Intercolonial Railroad. The honorable member for Cornwall was Premier of that Government, and it does not lie in his mouth now to object to what he himself did. But the honorable gentleman is entirely wrong when he says we had no power to make this compact with the Maritime Provinces. We had full power, express instructions to enter into it. HON. MR. HOLTON — Did the Parliament of England give you that power? That great inconvenience has been sustained by His Majesty's subjects inhabiting the provinces of Lower Canada and Upper Canada, from the want of some adequate means for regulating and adjusting questions respecting the trade and commerce of the said provinces, and divers other questions wherein the said provinces have a common interest ; and it is expedient that the legislatures of the said provinces respectively, be authorized to make provision for the joint regulation and adjustment of such their common interests. It is clear that some plan must be devised to meet the just demands of Upper Canada. It will be for your Lordship, in conjunction with the Committee, to consider if this should not be done by constituting some joint legislative authority, which should preside over all questions of common interest to the two provinces, and which might be appealed to in extraordinary cases. to arbitrate between contending parties in either; preserving, however, to each province its distinct legislature, with authority in all matters of an exclusively domestic concern. If this should be your opinion. you will have further time to consider what should be the nature and limits of such authority, and all the particulars which ought to be comprehended in any scheme for its establishment. The bill should contain provisions by which any or all of the other North American colonies may, on the application of the legislature, be with the consent of the two Canadas, or their united legislature, admitted into the union on such terms as may be agreed on between them. As the mere amalgamation of the Houses of Assembly of the two provinces would not be advisable, or give at all a due representation to each, a parliamentary commission should be appointed, for the purpose of forming the electoral divisions and determining the number of members to be returned on the principle of giving representation as near as may be, in proportion to population. The same commission should form a plan of local government by elective bodies, subordinate to the general legislature, and exercising a complete control over such local affairs as do not come within the province of general legislation. The plan so framed should be made an act of the Imperial Parliament, so as to prevent the general legislature from encroaching on the powers of the local bodies. A general Executive on an improved principle should be established, together with a supreme court of appeal for all the North American Colonies. The bill provides for the establishment of a central district at Montreal and its neighbourhood, at which the Government shall be carried on, and where the Assembly shall meet. The other parts of Upper and of Lower Canada are each to be divided into two districts. It is proposed that these districts should be formed for the purpose of becoming municipal districts, for the imposition of taxes and rates, for all local purposes. That whether protection or reciprocity shall be conceded or withheld, it is essential to the welfare of this colony, and its future good government, that a Constitution should be framed in unison with the wishes of the people, and suited to the growing importance and intelligence of the country, and that such Constitution should embrace a union of the British North American Provinces on mutually advantageous and fairly arranged terms, with the concession from the Mother Country of enlarged powers of self-government. Resolved — 1. That the inconveniences arising from the Legislative Union between Upper a Lower Canada, render desirable the dissolution of that union. 2. That a committee be appointed to enquire into the means which should be adapted to term a new political and legislative organization of the heretofore provinces of Upper and Lower Canada, either by the establishment of their former territorial divisions, or by a division of each province so as to form a confederation having a Federal Government, and a local legislature for each one of the new provinces, and to deliberate as to the course which should be adopted to regulate the affairs of united Canada in a manner which would be equitable to the different sections of the province. HON. MR. CARTIER — Whose notice was that? HON. MR. DORION. — It was in amendment of that of the honorable member for Sherbrooke, which I did not exactly like. HON. MR. HOLTON — and which that honorable gentleman did not venture to move, so that the House did not pronounce upon it. HON. MR. BROWN — But my honorable friend (Hon. Mr. DORION) made a speech, which I perfectly remember. He held this motion in his hand while he spoke. HON. MR. DORION — I made a speech on the motion of the honorable member for Haldimand, Mr. MACKENZIE, not on my own. For some years past, sectional feelings have risen in this country which, especially during the present session, have seriously impeded the carrying on of the administrative and legislative functions of the Government. The late Administration made no attempt to meet these difficulties or to suggest a remedy for them, and thereby the evil has it greatly aggravated. His Excellency's present Advisers have entered the Government with the fixed determination to propose constitutional measures for the establishment of that harmony between Upper and Lower Canada which is essential to the prosperity of the province. They respectfully submit that they have a right to claim all the support which His Excellency can constitutionally extend to them in the prosecution of this all-important object. Your committee are impressed with the conviction that whether we consider the present needs or the probable future condition of the country, the true, the statesman-like solution is to be sought in the substitution of a purely Federative for the present so-called Legislative Union; the former, it is believed, would enable us to escape all the evils, and to retain all the advantages, appertaining to the existing union. The proposition to federalize the Canadian union is not new. On the contrary, it has been frequently mooted in Parliament and in the press during the last few years. It was, no doubt, suggested by the example of the neighboring states, where the admirable adaptation of the Federal system to the Government of an extensive territory, inhabited by people of diverse origins, creeds, laws and customs, has been amply demonstrated ; but shape and consistency were first imparted to it in 1856, when it was formally submitted to Parliament by the Lower Canada Opposition, as offering, in their judgement, the true corrective of the abuses generated under the present system. By this division of power the General Government would be relieved from those questions of a purely local and sectional character, which, under our present system, have led to much strife and ill-will. The committee believe that it is clearly demonstrable that the direct cost of maintaining both the federal and local governments need not exceed that of our present system, while its enormous indirect cost would, in consequence of the additional checks on expenditure involved in the new system, and the more direct responsibility of public servants in the province to the people immediately affected by such expenditure, be entirely obviated. The proposed system could in no way diminish the importance of the colony, or impair its credit, while it presents the advantage of being susceptible, without any disturbance of the Federal economy, of such territorial extension as circumstances may hereafter render desirable. MR. POWELL — Who wrote that document? HON. MR. BROWN — I cannot exactly say who did the composition; but will not my honorable friend from Chateauguay (Hon. Mr. HOLTON) permit me to ask if his hand is not discoverable in it? (Hear, hear, and laughter.) If so, he well may be proud of it, for it is a masterly exposition. HON. MR. HOLTON — Will my honorable friend accept it as an amendment to his scheme? HON. MR. GALT — No; ours is better than that! 5. Resolved, — That in the opinion of this assembly, the best practicable remedy for the evils now encountered in the Government of Canada is to be found in the formation of two or more local governments, to which shall be committed the control of all matters of a local or sectional character, and some joint authority charged with such matters as are necessarily common to both sections of the province. 6. Resolved, — That while the details of the changes proposed in the last resolution are necessarily subject for future arrangement, yet this assembly deems it imperative to declare that no Government would be satisfactory to the people of Upper Canada which is not based on the principle of representation by population. HON. MR. HOLTON — Did you recognize the propriety of that course? HON. MR. DORION — We had the support of all who were in favor of the question. HON. MR. BROWN — Indeed, you had not. HON. MR. HOLTON — We should have fallen if we had attempted to deal with it. A VOICE — Oh, oh! "The British Government approves of it — the Legislative Council approves of it — this House almost unanimously approves of it the press of all parties approves of it — and though the scheme has already been directly submitted to fifty out of the one hundred constituencies into which Canada is divided, only four candidates ventured to appear at the hustings in opposition to it — all of them in Lower Canada — and but two of them were elected." Let there be no mistake as to the manner in which the Government presents this measure to the House. We do not present it as free from fault, but we do present it as a measure so advantageous to the people of Canada, that all the blemishes, real or imaginary, averred against it, sink into utter insignificance in presence of its merits. (Hear, hear.) We present it, not in the precise shape we in Canada would desire it, but as in the best shape the five colonies to be united could agree upon it. We present it in the form in which the five governments have severally adopted it — in the form the Imperial Government has endorsed it — and in the form in which we believe all the legislatures of the provinces will accept it. (Hear, hear.) We ask the House to pass it in the exact form in which we have presented it, for we know not how alterations may affect its safety in other places, and the process of alteration once commenced in four different legislatures — who can tell where that would end? Every member of this House is free as air to criticise it if he so wills, and amend it if he is able — but we warn him of the danger of amendment, and throw on him all the responsibility of the consequences. (Hear, hear.) We feel confident of carrying this scheme as it stands — but we cannot tell what we can do if it be amended. (Hear, hear.) Let not honorable gentlemen approach this measure as a sharp critic deals with an abstract question, striving to point out blemishes and display his ingenuity; but let us approach it as men having but one consideration before us — the establishment of the future peace and prosperity of our country. (Hear, hear.) Let us look at it in the light of a few months back — in the light of the evils and injustice to which it applies a remedy — in the light of the years of discord and strife we have spent in seeking for that remedy — in the light with which the people of Canada would regard this measure were it to be lost, and all the evils of past years to be brought back upon us again. (Hear, hear.) Let honorable gentlemen look at the question in this view — and what one of them will take the responsibility of casting his vote against the measure? Sir, the future destiny of these great provinces may be affected by the decision we are about to give to an extent which at this moment we may be unable to estimate — but assuredly the welfare for many years of four millions of people hangs on our decision. (Hear, hear.) Shall we then rise equal to the occasion? — shall we approach this discussion without partisanship, and free from every personal feeling but the earnest resolution to discharge conscientiously the duty which an over-ruling Providence has placed upon us? Sir, it may be that some among us will live to see the day when, as the result of this measure, a great and powerful people may have grown up in these lands when the boundless forests all around us shall have given way to smiling fields and thriving towns — and when one united government, under the British flag, shall extend from shore to shore: — but who would desire to see that day if he could not recall with satisfaction the part he took in this discussion? On motion of the Hon. Mr. MCGEE, the debate was further adjourned till Thursday evening. CONFEDERATION DEBATESA resource hosted by the University of Victoria that makes all of the Confederation debates accessible to present and future generations.